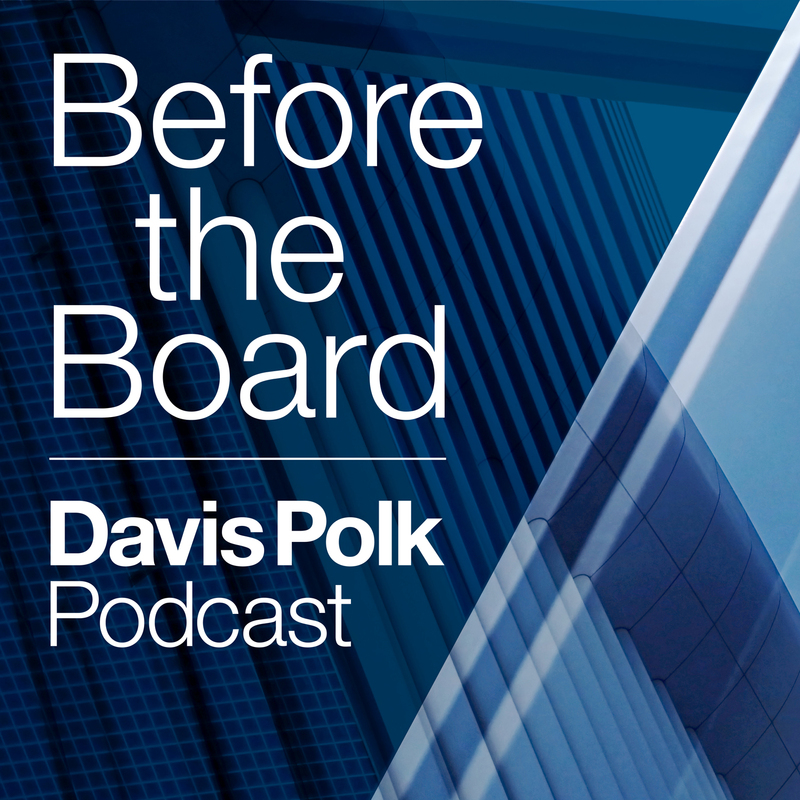 Before the Board is a Davis Polk podcast featuring conversations on developments in corporate governance. The series provides insight on the current issues facing boards of directors, including shareholder engagement, board leadership, strategic planning, institutional investors, proxy advisory firms, executive compensation, board composition, activism, corporate and securities law, litigation and enforcement actions, cybersecurity, and much more. Before the Board (“BTB”) is a Davis Polk & Wardwell LLP podcast intended for informational, educational, and entertainment purposes only, and is not a complete overview or analysis of the topics presented. Neither BTB nor any of its component parts constitutes, or is intended to constitute, legal advice with respect to any particular circumstance. Use of BTB does not create an attorney-client relationship with Davis Polk & Wardwell LLP or any of its associated entities, or with BTB’s creator, hosts or guests, including any members of the Davis Polk Corporate Governance Group (collectively, the “BTB Entities”), and should not be relied on or treated as a substitute for specific advice relevant to particular circumstances. The content provided by and through BTB, including but not limited to commentary on laws, regulations, rules, and case decisions, are subject to revision, interpretation, or even nullification after the date of recording. The BTB Entities shall not be liable for any loss that may arise from any reliance on BTB or its component parts. BTB should not be copied, distributed, published or reproduced, in whole or in part. If you have any comments or questions, please contact beforetheboard@davispolk.com.